Welcome to the User Manual for Intego FileGuard, Intego's program for protecting your confidential files in virtual safes. Use the Table of Contents below to go to the different sections of the manual. For information about installing FileGuard and updating the program with Intego NetUpdate, see the Intego Getting Started Manual. Whether you use your Mac for work, play, or everyday activities at home, it contains a variety of files. You may have music, movies and photos; word-processing documents, spreadsheets and contact information; reports, letters and to-do lists. Most of these files need no special protection, but some of them are confidential: files for your business, personal financial records, private e-mail, instant message logs and more. Mac OS X protects your files by requiring a password to access your user account, but hackers, vandals and data-thieves may be able to bypass this protection. This is even more of a threat if you have a laptop, and use it on the road. If you lose your laptop, it may contain much more than just your vacation pictures and itinerary. FileGuard creates virtual safes that provide unbreakable protection for all your sensitive files. You can create as many safes as you want, using them for different types of files: you can create a safe for your e-mail, another for your business documents, another for your financial records, and one for schedules, contacts and calendars. Each safe can have its own password, and when you close a safe, there's no way that anyone can get at its contents. You can set the upper limit of a safe's capacity: it will automatically increase in size to that limit as you add files to it. FileGuard's safes are not only secure, they are also portable. You can store safes on file servers or external disks and you can keep them on your home or office Mac with no risk of anyone opening them. You can even send FileGuard safes to friends, family or colleagues, and they can access files contained in those safes, as long as they have the password, even if they don't have FileGuard software. FileGuard's safes are easy to access. Double-click a safe's icon in the Finder, then enter your password to open it. When a safe is open, you simply drag files to its icon to add them to the safe. You can use floating avatars for your safes, unique icons that display above other windows on your screen, so you can drag files to them regardless of which windows are visible; alternately, you can make your safes behave like ordinary windows, hidden until you bring them to the front. You can also access your safes easily from the Intego menu that displays in your menu bar: you can open a safe, no matter where it is stored, by simply selecting it from the Intego menu and typing your password. Finally, you can access safes from standard Open and Save dialogs, so you can select files from them to work with, or save files directly to your safes to avoid writing them in unprotected form to your hard disk. 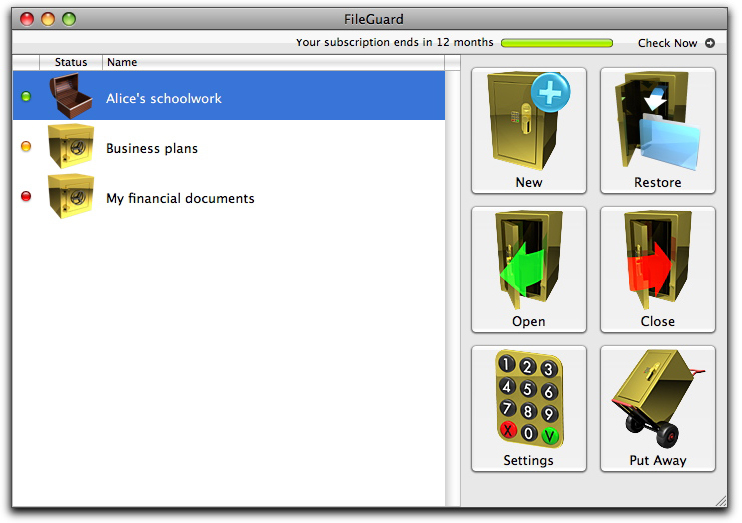 FileGuard has a practical assistant that helps you create safes easily, and you can also use the FileGuard application to create safes and change their settings. This application lets you manage all your safes, whether open or closed, change settings, change the sizes of safes or compress them, and much more. In addition to creating safes that you can use for any confidential files, FileGuard lets you create special safes that protect your e-mail and instant messaging logs. When you create one of these safes, FileGuard copies all the files for your e-mail or instant messaging program into the safe. When you open the safe, then launch a protected program, that program reads and writes from its safe. You can then quit the program and close the safe to ensure that your sensitive files remain protected. 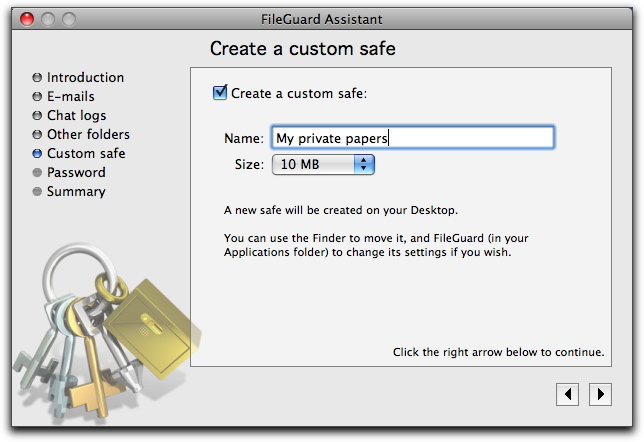 FileGuard has an assistant that walks you through the steps necessary to create these safes, as well as safes for specific folders (such as your Documents folder), and custom safes for any folder you want to protect. Mac OS X 10.5 or higher; FileGuard is fully compatible with Mac OS X 10.6 Snow Leopard and Mac OS X 10.5 Leopard. FileGuard is not supported for use on Mac OS X Server. For information on installing and serializing Intego FileGuard, see the Intego Getting Started Manual. Intego FileGuard uses Intego NetUpdate, which is installed with the program, to provide updates to the program. For information on using NetUpdate, see the Intego Getting Started Manual. To get information about your copy of FileGuard, choose FileGuard > About FileGuard. It gives information about Intego FileGuard, such as the version number, your support number (a number you will need for technical support), and a clickable link to send e-mail to Intego's support department. Technical support is available for registered purchasers of Intego products with valid subscriptions from the Intego Support page. FileGuard protects your files by storing them in encrypted containers known as safes. Once you've unlocked a safe with your password, it works almost exactly like an ordinary Mac OS X folder: you can add files to it, remove files from it, access it from an application, delete it, and so forth. If you don't know a safe's password, however, its contents are completely unavailable to you: in fact, you can't even see what's inside it without the password. WARNING: FileGuard safes are extremely secure. If you lose your passwords, your safes' contents	will probably be lost forever. Creating Safes to set aside protected spaces for your files. Modifying Safes to change security, interface and size attributes, whether during their creation or at a later time. Working With Safes to manage files in safes, and to work seamlessly and efficiently with the programs you use every day. By default, safes contain copies of the folders and files you want to protect, but the originals stay where they are. For complete protection, you'll also need to delete those originals: see the "Advanced Options" section of Modifying Safes. Unless you change its settings, a newly created safe's icon will appear on the Desktop, its animated avatar will appear on another part of the screen, and its folder will open. For details on how to work with avatars and open safes, see Working With Safes. 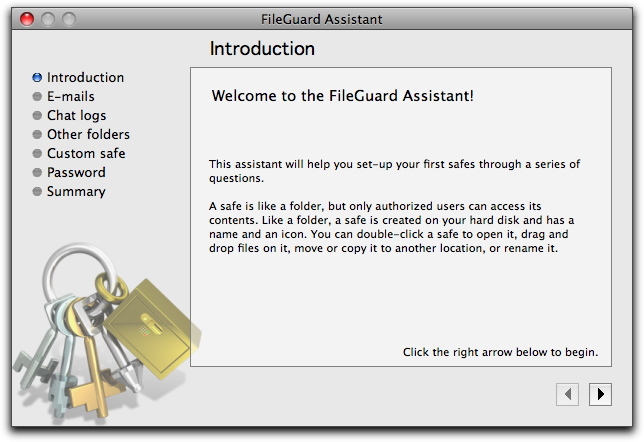 The first time you launch FileGuard, you'll be greeted with the FileGuard Assistant. (You can also launch it at any time by choosing the menu selection FileGuard > Launch FileGuard Assistant.) The first window welcomes you to the program and explains a bit about safes. Clicking the right arrow in the bottom-right corner takes you to the next screen. You can go backwards in the process at any time by clicking the left arrow, or skip screens by clicking the right arrow repeatedly. In the next screen, you can create safes to protect your e-mail from prying eyes. As you receive or send new e-mail, it will be protected as well. Only those programs that are installed properly on your Mac will be available for choice. In our example below, we have two programs installed, and we've chosen to protect only e-mail stored in Apple Mail. When protecting both chat and e-mail files, FileGuard plans for the future by first creating a safe that's ten times the size of the current chat transcript folder or e-mail folder. You may eventually need to make these safes larger as you send and receive more messages: for instructions, see the "Appearance and Size" section in Modifying Safes. 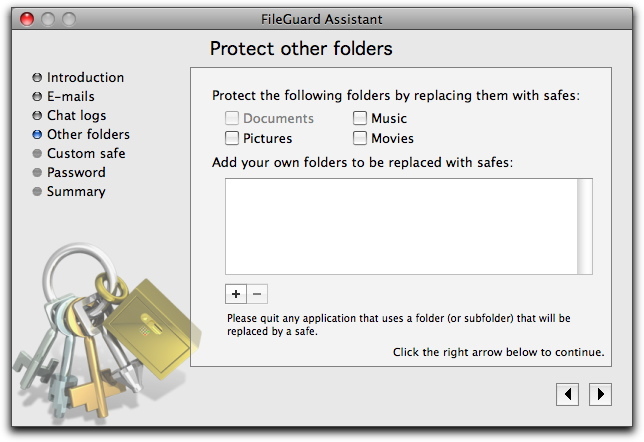 FileGuard protects these files by finding the folders where they're usually stored and turning them into safes. If you've moved or deleted a program's folder, FileGuard won't be able to protect it, and the checkbox for that program will be unavailable. 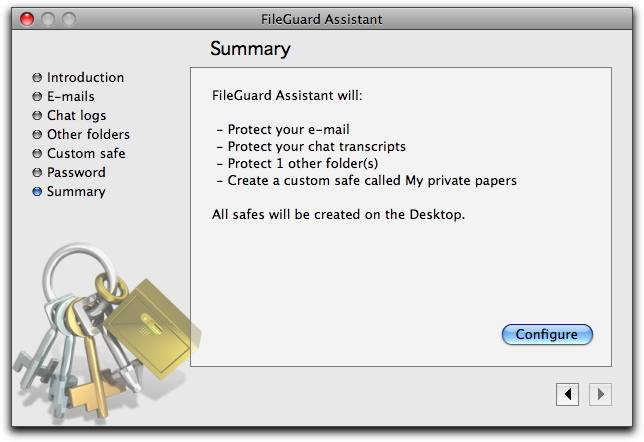 The safes that FileGuard creates for e-mail and chat programs will appear on your Desktop and have obvious names. 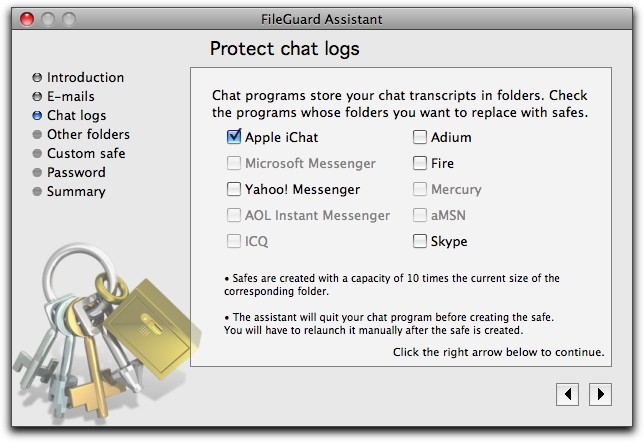 For example, protecting your iChat folder will result in a safe named "Chat - iChat". The next screen gives you an opportunity to protect any other folders on your hard drive. The top section offers four checkboxes for folders that you're most likely to want to protect: Music, Pictures, Movies, or your entire Documents folder. Here, we've chosen not to protect any of those folders. You might find that one or more of the checkboxes is dimmed and unavailable. For example, if in the previous screen you had chosen to make a safe to protect your iChat logs, the Documents checkbox will be dimmed, because the folder containing iChat logs is inside the Documents folder. One way to correct this conflict would be to go back to the beginning of the FileGuard Assistant and uncheck the all checkboxes that would cause safes to be created inside the Documents folder. When you return to this screen, the Documents checkbox will be available. Drag the folder into the window. The enclosing box will display a dark outline, and your cursor will have a + sign next to it to show that FileGuard recognizes the folder as valid. Folders that you add to this window then appear as paths - that is, a description of where the folder is stored on your hard drive. When you're done, click the right arrow. As before, you can't make a safe inside a safe. If you attempt to do so, you'll receive a warning message, and FileGuard will remove the last folder added. The next screen lets you create an empty safe for future use. The popup menu lets you choose how big you expect this safe to be, from 1MB to 100GB. Each menu selection is ten times the size of the one above it. General business documents 100 MB - 1 GB Business documents tend to be mostly text, which doesn't take up much room. Graphics files, such as presentations, photos, logos, and charts, increase storage needs substantially. Photos and graphics 1 GB - 10 GB Storage needs of digital photos vary depending on the camera's resolution and compression scheme. A photo from a mobile phone might be less than 1 MB, while a high-end camera's uncompressed image could be 20 MB or more. Media files 10 GB Music and movies are among the largest files on your computer, so safes built to store them need lots of room. Click the right arrow to go to the next screen in the Assistant, where you enter the safe's password and confirm it by typing it in a second time. Click the right arrow to go to the final screen of the Assistant. Finally, you arrive at a confirmation screen that summarizes the actions you have selected in the assistant. Clicking the Configure button creates the safes you requested, and the FileGuard Assistant then quits. FileGuard itself remains active, however, and the folders you indicated are now protected: you'll find their safes on your Desktop. To stop the process and change your selections, click the left arrow button and make your corrections before returning to this screen and clicking Configure. A safe that's in the process of being created will have a different appearance from a safe that's ready for use. For example, the default Classical icon appears as dull metallic gray while being created, but becomes shiny gold when ready. You can also create safes using FileGuard's main window. To do this, launch the program either by double-clicking its icon in your Applications folder or choosing Open FileGuard from the Intego menu in your menu bar. Then, either choose Safe > New…, or click the New button. If you know what items you want in the safe, drag them from the Finder onto the New button to create a safe containing those items. You'll see a settings window for options that will apply to your newly created safe. If you just want to quickly create a safe, you can ignore all these options except for the Password and Verify fields. After you've entered your password into those, click Create. 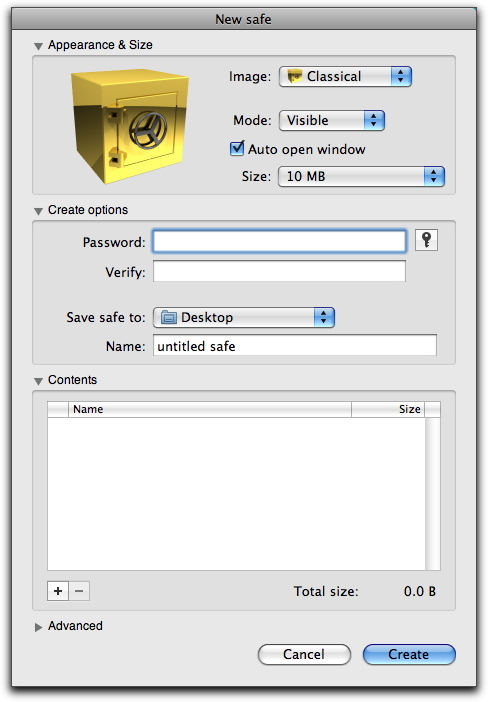 A new safe titled "untitled safe" will appear on your Mac's Desktop. This settings window is very similar to one you'll see later, in the section Modifying Safes. There are two main differences. Drag files or folders into the Contents section. Second, this settings window has a Create options section. The first part is where you enter the password that will become the safe's main key. Enter your desired password twice: once in the Password field, and once in the Verify field. If the two don't match, the safe will not be created, and you'll be prompted to try again. FileGuard provides access to Apple's Password Assistant to help you pick passwords that are both memorable and secure. To use the Password Assistant, click the key icon to the right of the Password field, and you'll be presented with a suggested password. 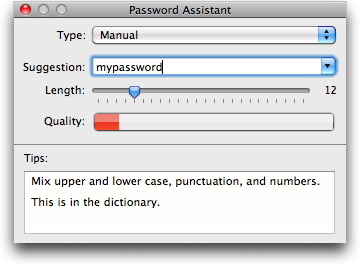 The popup menu at the top of the Password Assistant lets you choose from several types of suggested passwords. Memorable passwords use whole or partial English words separated by at least one number and one non-alphanumeric character. Because they contain "real" words, they're easy to remember. Letters & Numbers passwords are less memorable, but perhaps easier to type. Numbers Only passwords are easy to type on a 10-key pad, and some people find them easy to remember. Random passwords mix letters, numbers, and other characters. They tend to be hard to remember, but are extremely secure. FIPS-181 compliant passwords are random strings of lower-case letters that fit a 1993 U.S. Government edict for Federal Information Processing Standards. No matter which password-generation category you choose, one password displays in the Suggestion field, and the popup menu at the right of this field offers a list of other suggested passwords. You can change the proposed password's length with the Length slider. After you've rejected the first suggestion, the Quality bar tells you how strong the password is, and the Tips field shows you ways you could make it stronger. The bottom part of the Create options pane lets you set the safe's name and default location - that is, where on your hard drive it is stored. However, that's not necessarily where a safe's files will be when you open the safe: see the "Advanced Options" section under Modifying Safes for details on changing a safe's "mount point". 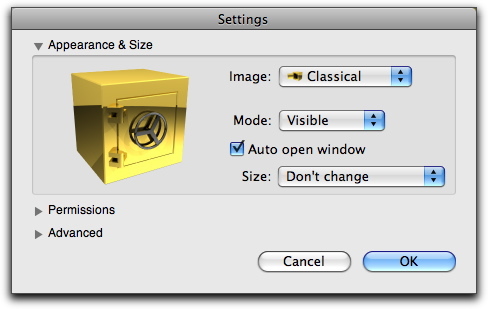 The Appearance & Size and Advanced sections of the Settings window are discussed in detail in Modifying Safes. Another way you can create a safe is by holding down the Control key while clicking in the Finder, or by clicking your right mouse button. The contextual menu that appears will vary depending on your Mac's configuration, installed programs, and what your mouse was over when you clicked. This process is different depending on whether you use Mac OS X 10.5 or 10.6. With Mac OS X 10.5, Leopard, when you display the contextual menu, you'll see a choice labeled More, which leads to a FileGuard menu, with the submenu choices New FileGuard Safe… and New FileGuard Safe with Contents…. Contents of safe that's created from "New FileGuard Safe with Contents…"
The Desktop, or any window where no items are selected (only with Mac OS X 10.5) All items that appear on your Desktop, or all the items in the window. A single file The file. Multiple files All the highlighted files. To do this, either Command-click or Shift-click until all the files you want to protect are selected, hold down Control while clicking any of them, then choose New FileGuard Safe with Contents… from the contextual menu. A folder The folder and all the files it contains. A safe The safe, inside a new safe. By default, safes created by selecting New FileGuard Safe with Contents… are read-only because they're compressed to take up as little space as possible. To be able to add items to such a safe or modify its contents, change its size in the settings window to something other than Compressed. For more details, see the Size & Appearance section under Modifying Safes. Additional options appear when you Control-click safes themselves or their avatars. These choices will be discussed starting on Working With Safes. 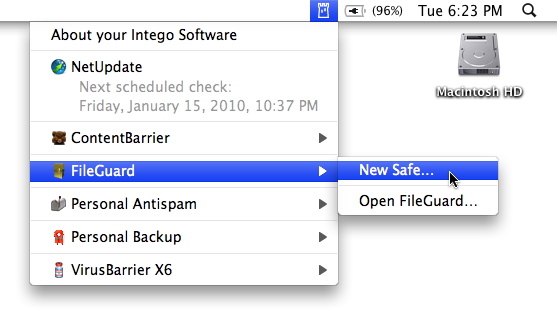 You can create a safe by clicking the Intego menu and choosing FileGuard > New Safe…. This works the same as selecting New Safe… through a contextual menu, as described above. When FileGuard is running, you can also create new safes by Control-clicking its icon in the Mac OS X Dock, or by clicking and holding it down for a few seconds. The option New Safe… behaves as when the same choice is made through any other contextual menu or the Intego menu. Change a safe's icon. 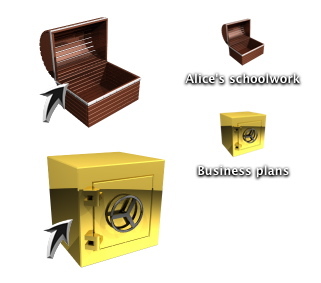 FileGuard includes 16 beautiful safe icons that can help you keep track of safes' contents. For example, you could put highly personal documents into safes with the evocative Heart icon, and give business documents the intimidating Chestnut icon. Display a safe's animated avatar. Even if the safe is buried in several layers of folders, FileGuard makes an animated icon for it, called an avatar, which can float above all other windows for easy access. Automatically compress safes so that a safe takes up even less space on your hard drive than the original files it contains. Compact safes to reclaim space when you remove items from them. Set three levels of passwords to control access to the files within a safe. For example, let's say that you're a college professor who's given out an electronic test. Your students will return their test files, and your graduate assistant will check to make sure they're all in on time, but not actually read them. You could create a safe where your students have write-only access (as a "drop box"), your graduate assistant has read-only access, and you have full access to retrieve, change, and replace the documents. Set safes to automatically close after a time period you specify, to prevent others from accessing your sensitive data when you walk away from your desk for a coffee break. Set safes to open in a different location from where the safes themselves are stored. For example, you could store all your safes deep in a folder, but have their contents appear on the Desktop when they're opened. By pressing the Option key while: double-clicking the open safe's icon, double-clicking the open safe's avatar, double-clicking the opened safe in FileGuard's main window, or choosing the open safe's name in the FileGuard submenu of the Intego menu. In any case, the settings window is only available when the safe is open by the safe's owner. For information on how to open safes, see Working With Safes. The settings window is similar to the one that appears when you first create a new safe, but with two differences: first, it lacks the Contents section, which is discussed in the "Creating Safes with the FileGuard Main Window" section under Creating Safes. Second, a Permissions section takes the place of the Create options section. In total, there are three sections: Appearance & Size, Permissions, and Advanced. We'll discuss each of these in turn. If you don't see all the options, click the disclosure triangles as needed. Conversely, you can use the disclosure triangles to hide sections if the window is too tall to fit on your screen. Finally, there's help in FileGuard itself. Some controls in the Settings window reveal help texts when you hover the cursor over them for several seconds. The first section controls four facets of how you interact with safes: the avatar, the safe's visibility, whether a safe's window opens automatically, and the safe's size. The first popup menu offers a selection of 16 avatars that you can use to make your safes stand out. Each is animated, and clearly indicates whether the safe is closed or open. Selecting any avatar in the Settings screen shows a repeating loop of the animation that displays on your screen when you open or close this safe. The second popup menu determines whether an avatar will display when a safe is available. By default Visible is selected, which means that the avatar will sit on your Desktop, but could be covered up by other windows. If you choose Floating, the avatar will appear above all windows, so it's always available. Finally, Hidden means that no avatar will appear for this safe. The Auto open window checkbox determines whether a safe will automatically show its contents whenever it's opened. If not, you'll have to double-click it twice: once to open it (and enter its password), then a second time to show its contents. The Size popup menu determines the maximum size of your safe. 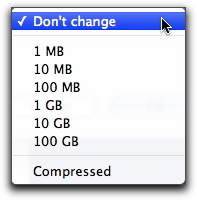 The Don't change choice leaves it at its current size; the Compressed choice uses your Mac's power to shrink the safe's contents to save space. For more information about determining the optimal size for your safes, see the "Creating Safes with the FileGuard Assistant" section under Creating Safes. Next on the Settings window is the Permissions section, where you can grant partial or full access to safe contents to a select group, or to the public at large, and allow data in your safe to be recovered by Intego's technical support team under extreme conditions. The checkbox Allow data recovery if password is lost sets up your safe in a way that will permit Intego's technical support team - and no-one else - to open safes whose passwords have been lost or forgotten. A typical case would be for important business data that was controlled by one person, who then left the company and hasn't remained in communication. This checkbox is unchecked by default, which means a lost password results in irretrievably lost data. For more details on recovering data with this feature, contact Intego technical support at the addresses given at the end of this manual. The second part of the Permissions section, Allow group, lets you assign another password to the safe, to grant limited or full access to others; the third part, Allow others, dictates the access level of people who enter no password at all. You have four options in the Allow group and Allow others popup menus: None, which grants no access to the group or public; Read only, which allows them to copy files from the safe, but not change the safe's contents; Drop box, which only allows them to place items into the safe, but doesn't allow them to see what's in it; and Read & Write, which grants them the same access that you have. But even if you grant everybody else full Read & Write access, they still won't have your powers to change the safe's settings: therefore, you can rescind those privileges, or change how the safe behaves, at any time. The bottom section of the Settings window, Advanced, controls a few of FileGuard's finer points. Do nothing The original files will remain where they are in addition to being put in the safe. This is a good option when you're backing up files to a safe. Move to the Trash The original files are removed from their locations and placed in the Trash. They will be permanently deleted only when you empty the Trash. Delete The original files are removed from your hard drive. Secure delete (once) The original files are removed from your hard drive, and the space they used on your drive is overwritten with random characters. Secure delete (7 passes) As above, but with increased security. Secure delete (35 passes) As above, but with the maximum level of security. The Auto compact popup tells FileGuard to examine the safe whenever it is closed to reclaim space left when items in it were removed. If FileGuard can save a certain amount of space on your hard drive by recovering empty space, it will do so. When Always is selected, FileGuard will attempt to save space every time you close the safe. Note that this process may result in a slight lag when you close safes. The Auto close popup blocks access to your safe if you haven't used it for a set period of time. 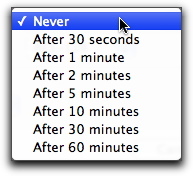 When you choose any option other than Never, the safe will close automatically after the given period. The Close on sleep checkbox closes this safe when you put the computer to sleep, such as when you physically close a laptop. See Working With Safes for important warnings regarding files that are open when a safe closes. The Encryption popup lets you choose from two levels of encryption: AES-128 or the more-secure AES-256. The Mount point popup lets you choose where a safe's contents will appear when the safe is opened. This is an important feature of FileGuard's flexibility: you can store safes anywhere, but direct them to "mount" - that is, create a virtual disk containing your items - anywhere on your Mac. If you leave the Default choice in place, open safes will appear in the Safes folder, located in your home folder. You should only change the mount point when you have a particular reason for files to appear in a different location. For example, safes created in the FileGuard Assistant for e-mail and chat programs have a different mount point, because those e-mail and chat programs expect to find their contents in specific places. By changing the mount points for these safes, the e-mail and chat programs work normally: only you know that FileGuard has protected their contents. To change the mount point manually, choose Path from the popup menu, navigate to the desired location, then click Open. You've learned how to set up safes to suit your needs: now it's time to put them to work. Although most of FileGuard's functions are available by double-clicking or Control-clicking safes in the Finder, sometimes you want to manage all your safes from one place. You can do that in FileGuard's main window. To see it, launch FileGuard by double-clicking its icon or choosing it from the Intego menu. FileGuard's main window is in two parts: a list of available safes, and buttons for controlling them. In this example, three safes are available. The colored dot in the leftmost column indicates the safe's status: green for open, yellow for closed (but not put away), and red for closed and put away. The second column shows the avatar you chose for that safe, which can be changed at any time through that safe's Settings window, and also shows the safe's status (open or closed). The third column shows the safe's name; if you hover your cursor over a safe's name, a tooltip displays showing the safe's path. This list automatically updates every few seconds, and immediately whenever the FileGuard main window is brought to the front. If you throw away a safe, for example, it will disappear from the list as soon as you empty the Trash and return to this window. The right side of the screen shows buttons that apply to the safe that's selected. If no safe is selected, only the New button is available. Like a standard folder, A FileGuard safe can be open or closed. FileGuard safes can also be Put Away, which closes safes in a more complete way. Open (green) The safe's contents are fully accessible to the extent allowed by its settings: you can add files to it, remove files from it, change its settings, and see its avatar on the Desktop. However, you can't delete the safe, or move it to the Trash. Closed (yellow) The safe's contents are inaccessible until you open it and enter a password (if applicable), but the avatar is still available. You can't add items to or delete items from the safe, change its settings, or delete the safe itself. This state only occurs when you've set the safe to show its avatar: closing a safe whose avatar isn't visible is the same as putting it away. Mac OS X treats a closed safe as though it's an open file, but you can't get at its contents. WARNING: If a safe contains open files when you close it or put it away, you won't be able to save those files back to the safe. Instead, use Save As… to save those files to another location. When you re-open the safe, it will contain the last saved version of the file, and won't include changes you made after closing the safe. Replace the copy in the safe with the more recent copy you saved elsewhere. WARNING: Some programs treat open files in unusual ways. If you experience problems with documents inside safes, try quitting their programs entirely before closing the safe. No matter which method you use, opening a closed or put-away safe brings up a dialog box, prompting you to enter a password. If you've given access to a safe through the Allow group or Allow others settings, you can open the safe with those access restrictions here: see the "Permissions" section under Modifying Safes. 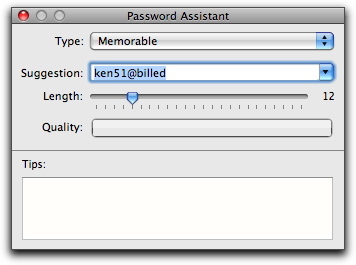 The Store password in keychain checkbox remembers what you enter in the Mac OS X keychain that's specific to the current user. It's a good idea to not check this box if other users access your Mac using your account, unless you have changed your keychain's password. By default, your keychain's password is your login password, and your keychain unlocks when you log into your Mac. You can change this password in the Keychain Access application, located in your /Applications/Utilities folder. See the help for Keychain Access to find out how to make this change. If you created safes using the FileGuard Assistant, you might remember that you had the option of protecting folders of e-mail and chat communications. (For more information about this process, see the "Creating Safes with the FileGuard Assistant" section under Creating Safes.) Those e-mail and chat folders are converted into password-protected safes, and their original folders are deleted. When you open one of these safes, it opens so it resembles a folder (at least to Mac OS X) that the e-mail or chat program can see. To put it another way, you have to open a file's safe to see its contents through an application such as an e-mail or chat program. Applications differ: some require all of their files to be available at launch, while others are less strict. The best policy is to open the safe you need before launching the application, and quit the application before closing the safe. By default, each safe has an avatar - that is, a visual representation of the safe in a different form. You could think of the safe file and the avatar as being two doors that enter the same room: you could repaint one door or even board it up, and neither the room's contents nor the other door will be affected. You see a safe's avatar when the safe is in its open or closed state, but not when the safe has been put away. Here's an example of two safes, one open and one closed, and their avatars. When these avatars first display, they'll all appear at the same location on your screen; however, you can drag them wherever you like. Avatars remember where they were last placed, and will appear in the same place after you put their safes away and re-open them. In other respects, avatars act like the safe icons they represent. If you have permission to change the contents of a safe, you can add files to it by dragging them on its avatar; likewise, you can reveal an open safe's contents by double-clicking its avatar. You can change an avatar's appearance, including whether it floats above other programs or appears at all when its safe is open. For details, see the "Appearance & Size" section under Modifying Safes. When first creating the safe: Drag them to the Contents section or click the + sign. See the "Creating Safes with the FileGuard Main Window" section under Creating Safes. Highlight one or more files and press Command-Delete to send them to the Trash. Note: when dragging items from the Finder to a safe's window, icon or avatar, you can cause the original items to be deleted by holding down the Command key when dragging. If you see a small icon of a pencil with a line through it at the lower-left corner of a safe's window, this means you don't have permissions to write to the safe. You opened the safe using the "group" or "others" password instead of the safe's main password, and those passwords don't have write access. To write to the safe, close it and re-open it using its main password. See the "Permissions" section under Modifying Safes. The safe's size is set to Compressed, which makes the safe read-only. This commonly happens when you create safes through the New FileGuard Safe with Contents… option in the contextual menu. To make the safe writeable again, change its size in the Settings window to something other than Compressed. See the Size & Appearance section under Modifying Safes and the "Creating Safes with Contextual Menus" section under Creating Safes. A safe in its put-away state behaves very much like any other file: you can send it via e-mail, transmit it over a network, or carry it on a portable hard drive, USB drive, CD, or DVD. There's only one rule to remember: to ensure data integrity, make sure the safe has been put away before making a copy. When a safe has Closed or Open status, your Mac treats it like an open file: copies made from such safes may not have the contents you expect, or may behave erratically. 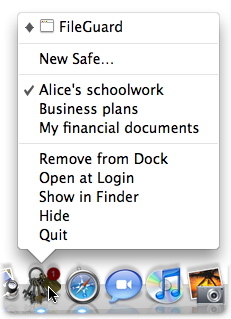 To rename a safe, click its icon in the Finder and press Return on your keyboard. The name of the safe highlights, and you can type a new name. The new name won't be reflected in the FileGuard main window until you've made the FileGuard the active, frontmost program, or waited a few seconds for the list to refresh by itself. 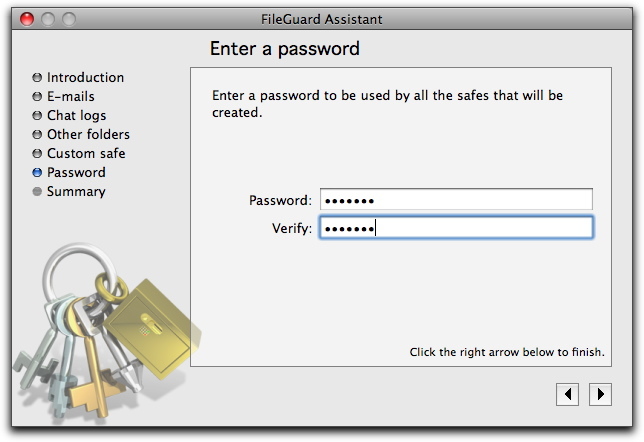 Although you need the FileGuard program to create and modify safes, you can open them on any Mac. They will appear as read-only safes, avatars intact, and be protected by the same passwords. For this reason, you can use safes to send files to friends or colleagues in total security - even if someone intercepts the safes, they cannot get at their contents without the password. For another person to be able to open a safe, you'll need to send them the password. Don't do this by e-mail, because that's not secure; it's best to do this over the telephone. 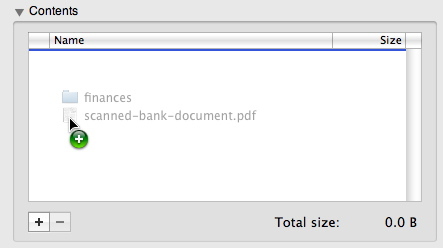 To delete a safe, click its icon in the Finder and drag it to the Trash, or press Command-Delete. If it has Open or Closed status, you'll get a warning that it "cannot be moved to the Trash because it is open". Put it away, then try again. Make sure you've made copies of any files you want to keep before deleting a safe. Safes containing data for e-mail and chat programs are special cases, as they need to be in a specific location for those programs to find them. You might want to move those safes to another location - for example, to a network drive, or a part of your hard drive that's regularly backed up. Should your e-mail or chat program be unable to find the data files it needs, select the safe and click the Restore button to return them to their original locations and delete the safe that contained them. When FileGuard is running, its icon in the Dock shows a list of safes on your Mac, with check marks next to those that are open, and the total number of open safes in a red badge. Control-clicking the Dock icon, or clicking it and holding down the mouse button for a few seconds, presents you a list of safes on your Mac, along with a New Safe… option. 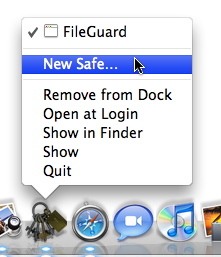 FileGuard safes can be located anywhere on your Mac. However, those created to replace e-mail and chat transcripts need to have mount points set for specific locations, or those programs won't be able to find them.